ALERT: This report includes details and visual material that may not be appropriate for all viewers. Discretion is advised. ST. GEORGE — Members of the Clearfield community gathered Sunday afternoon to promote awareness of animal abuse and honor the life of a cat named Sage, who died Thursday after being severely tortured. A reward fund for information leading to the arrest and conviction of the person or persons responsible has grown to $47,000. After having gone missing for a few days, Sage reportedly returned home Wednesday morning badly beaten and abused, barely able to move. 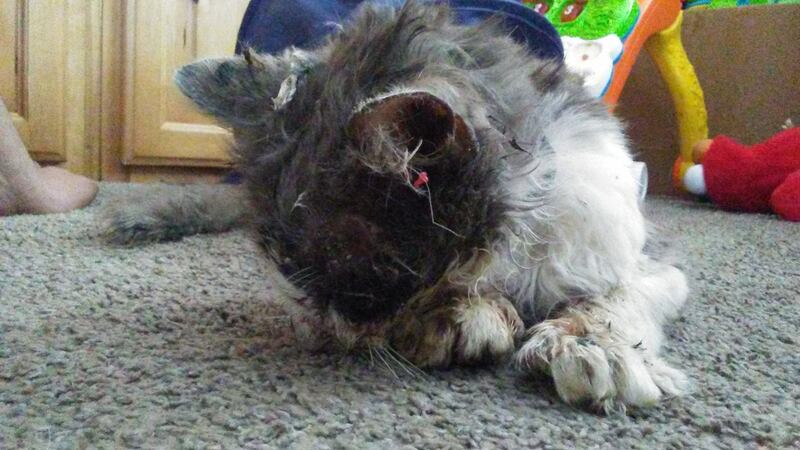 The cat suffered multiple broken bones and someone apparently applied hot glue to the animal’s eyes and genitalia. The cat was treated but ultimately died from his injuries. Since then, the family has received an outpouring of support from people around the world with words of support and monetary donations toward the reward fund, which has since grown substantially since its initial offering of $2,500 to $47,000. Over 150 people attended the candlelight vigil in a show of support for the mourning family, which included a moment of silence and an announcement by the Humane Society of Northern Utah of a new funding effort toward future animal abuse cases, according to a report by Fox 13 News. While the case remains the subject of investigation by Clearfield Police, anyone with information may call Davis County Animal Services at 801-444-2200 or John Fox, Humane Society of Utah chief investigator, at 801-261-2919 ext. 210. Humane Society of Utah Sage donation page. They really need to catch the idiot that did this before he graduates to people. I just don’t understand how anyone could do that to a sweet kitty. A person who can do that to an animal would have no problems doing that to a child. I hope they catch him/her before they strike again! Exactly right. If there’s a Hell, perpetrators of crimes like this belong in it. Out of sight out of mind. There are plenty of sadistic psychopaths out there. I wish people wouldn’t let cats roam or be an “outdoor cat”. Your pet likely won’t live a long life and felines are terribly destructive to wildlife. Cats should be killed humanely; there’s just no reason to make an animal suffer. This may well become the world’s most expensive house cat, so let’s hope they catch the perp. But let’s be real, even if caught he’ll do a minimal amount of jail or get a slap on the wrist, and in a few years will likely be doing this to people. You actually can’t fix sociopathy; it’s a defect of the mind. Why do people let their cats outside?? It shortens their life, they have more health problems.. Keep costs indoors.. Hope they lock up the person and throw away the keys. This must be one of the most successful solicitations for helping find the perpetrator of an abused pet, on record. This is encouraging! A sizable amount of the reward money should be set aside to purchase the cheapest and least nutritional of cat food and have it served 24/7 to the dirt-bags that mutilated the cat. The owner(s) loved that little guy – and it loved them in return – many times over I’m certain. Bon Appetite! !